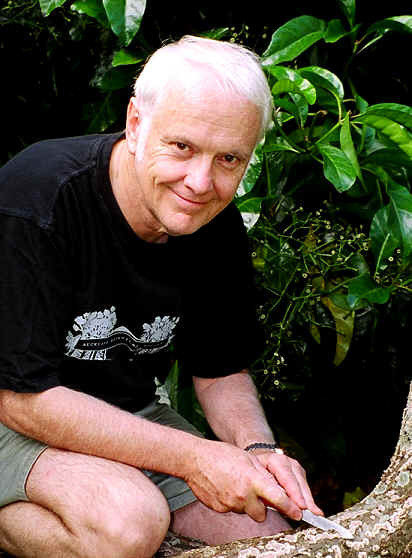 Funds to initiate this Award were provided through the kind donation by conservationist and botanist Geoff Davidson of proceeds from the sale of Pennantia baylisiana plants, a threatened species that Ross and Geoff were instrumental in saving from extinction. These proceeds were passed to Jessica Beever, Ross’s wife, who in turn chose that they be allocated for a Mycological Award in memory of Ross. Through a matched contribution from the Fungal Network of NZ, the initial sum of $10,000 was established as a nucleus for a sustainable fund to provide for an annual mycological award. Funds will be under the control of an elected Board of Trustees of the Ross Beever Memorial Trust, which is being established, and applying for Charitable Trust status, in 2015. The trustees are Jessica Beever, David Olovitch, Toni Atkinson and Tom Davies. One Ross Beever Memorial Mycological Award of NZ$500 may be awarded annually from 2015. The award is intended to provide financial support to a student who is studying full time at a post graduate level in mycology: i.e. completing PhD, Masters or Honours, on a topic relating to New Zealand mycology or plant pathology. The award may be applied at the discretion of the successful student to provide financial support for field work, study‐related travel, data analysis, reporting and living expenses, or any combination of these purposes. The award will be advertised during February each year, for applications to be considered by a subcommittee comprising members from the elected Council of the Fungal Network of NZ Inc. (FUNNZ) and from the Board of Trustees of the Ross Beever Memorial Trust (the Trust), ahead of the annual New Zealand Fungal Foray in May. The Award will be announced at the Colloquium (conference day) of the Fungal Foray. In selecting the successful applicant, the FUNNZ Council and Trust members will take into account academic merit and other scholarships and bursaries held by the applicant. The successful student awarded will be eligible to accept funding from other sources. The award will not be presented in the event that there are no suitable applicants and it will only be awarded once to any one person. The successful student will be encouraged to publish the results of the research relevant to this award. Application process: Fill in the application form and attach (max. 2 pages) a brief project outline along with the actual objective(s) of the study to be achieved with the award funding, the location of proposed research, a description of the proposed research methodology for the relevant objectives only, a proposed budget and a timeframe for the studies. Applicants must also enclose their CV, evidence of accepted enrolment, and a short reference from their supervisor. Awardees will be expected to present a paper at the following NZ Fungal Foray, or to prepare a written report on their project and how award funds were used within 12 months of the award.